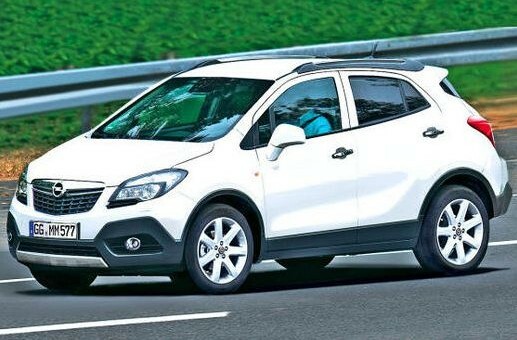 Word on the street has it that the Gamma II-based crossover expected from Opel will be called the Mokka, which apparently German for mocha. How adorable. The little crossover will officially make its public debut at the Geneva Motor Show in a few months, and as expected, will be just about identical to the subcompact Buick Encore that will be sold in North America. We can already see some obvious similarities between the two in the design of the front headlamps and body-mounted mirror placement, though the Opel version is absent of portholes. Opine on the vehicle in the comment section below, as well as our forum! That’s right! Subcompact crossover, ladies and gents. Smaller than compact! I was just shown some photos of the Encore, and the two will be nearly identical — in the same way as the Regal is identical to the Insignia. I didn’t see the rear end of the Encore, though, so I can’t comment on the similarities in the rear. This slots in nicely under Opel’s Antara compact… But it leaves room for at least one more crossover for Buick, if not two (compact and midsize). Seriously, unless they can see the Encore to women on a basis of it being ‘cute’, this may pose a problem for Buick in that it could be sales-proof. This is “new” GM’s first official screw up, I never thought the day would come so soon. Saturn yes, Buick heck no.., For the life of me I don’t get this vehicle… JD has some explaining to do. How does this represent Buick. I’m not sure slapping a Buick Shield and waterfall grille will make this a Buick. GM needs to be laser sharp on brand DNA and message. I’m sure there will be lots of marketing spin as to how this is the “future” of compact luxury; but this is a segment best left to Chevrolet. I don’t think Lexus would put the “L” on a Toyota Matrix. There is only so low a luxury brand should go. Mercedes may be able to get away with the A- & B-Class as it’s long been a “full line” manufacturer in Europe; but even MBNA executives are leery of Mercedes going that far down in the market and the very real potential of brand dilution in the US market (too late, if you ask me). BMW did it with MINI, which bridges the small car gap below the 1-Series. GM has the brands – Chevy, Holden and Opel/Vauxhall for a nifty mini CUV like this. Buick was supposed to be cushy luxury (Lexus). What happened? If it were up to me, I would make a Buick out of every Cadillac. The cars would be RWD-based, with AWD as an option. Buicks would be very soft — Lexus-like. Caddys would be very “stiff” and performance-oriented — BMW-like. Caddy and Buick would have totally different top hats (design) and (obviously) marketing messages and value-propositions. But Toyota has made a Lexus out of the Matrix; the CT200. Besides, I don’t think of it as “brand going lower than it should”. The 1-series is a subcompact and nobody is yelling at BMW for making it or going “too far downmarket”. I thought CT 200 was based on the Prius? The CT is most closely related to Matrix and Corolla. The HS is the Prius mate, which itself is loosely based on the Toyota Avensis (Toyota’s midsized sedan in Europe that’s more sporty and a bit smaller than Camry). Avensis and Camry are not related, but — as is the case with most global manufacturers — but most Toyota products do share many common parts. I don’t think it’s a matter of platforms anymore, so I am retracting what I said earlier about the Gamma. I’ve spoken to a few folks who have driven this guy. Apparently, the ride is impeccable and the NVH levels are kept to a very, very respectable minimum. This vehicle and Buick will be just fine if it rides softly and if (and only if) there is at least one more Buick crossover in the works that’s larger than the Encore. I would like to see a compact Buick CUV (Vue-sized) and a midsized Buick CUV (SRX-sized). The CT200h is a Prius, not a Corolla/Matrix. The platform itself is directly from Matrix. Powertrain is all Prius. They’re all very similar, at the end of the day. I believe Toyota’s designation of the architecture is MC, which can be used on anything from Corolla to Camry to Sienna to Avensis. PS: I came this close to getting a 135i with the stick. This close. Love that car. Because it’s a perfect car (for me, anyway). The 135 is quick (fast, even), and the driving experience is second to none. Everything is perfect — from the layout of the cockpit to the stick to the way it handles. The looks are kind of the weakest point, but I like them. GM should bring back Pontiac after all, to properly rebadge this thing, or Saturn. All I can say is that the Buick Encore better get damn good fuel economy, because that it is one tiny car! It looks like a Sonic with the rear boosted up a little. Thats probably one of the few reasons it will sell, if it does, because design definately wont be one of them. Define “forever”. And the reason the photo looks a bit off is because the contrast levels are extremely high. Despite this, the car matches up to what’s been teased by Buick… which has only been teased recently. But then don’t you think the backend looks a little off? It just seems to be the design. Either way, the pics show how the car will look like; the small details aren’t that important right now. I was trying to figure out what brands this vehicle would fit well with let’s see here (any brand goes past and present, considering design language) Toyota 8 years ago, Kia or Hyundai 8 years ago to present, Opel 8 years ago ( not now) expect more refined. This concept lacks serious refinement, The Buick version better Be much more refined and improved sheet metal this looks like a toy car not a luxury vehicle. What happened to the concept vehicle that was beautiful, this looks absolutely rediculous. That doesn’t look anything like the Encore picture that I saw. Not quite; the Meriva is not the same as the Encore, or the Mokka. They will ride on similar platforms but one is an MPV (Meriva) while the other is a small CUV.